Structural studies of protein-ligand and protein-protein interactions. Research in our lab focuses on characterizing the molecular details of protein-ligand and protein-protein interactions and the mechanisms by which changes in these interactions regulate physiological processes. These studies have concentrated mainly on the role of the calcium ion in mediating changes in protein-ligand interactions which subsequently may alter protein-protein interactions to modulate function. However, other protein-ligand interactions are also under study including enzyme-effector and protein-protein complexes. 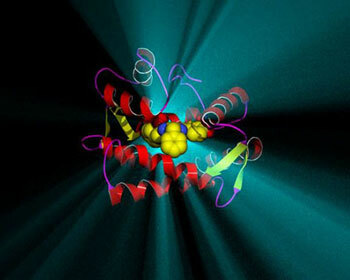 X-ray crystallography is a major tool used in these studies. 1. The crystal structure of the calcium-dependent photoprotein aequorin. This structure shows how the protein binds the ligand coelenterazine creating an environment where the oxygenated intermediate is stabilized. Subsequent binding of calcium to the protein then destabilizes the intermediate, permitting completion of the oxidation reaction which leads to light emission. Summary of the reactions occurring in the aequorin system which result in light emission and to the subsequent regeneration of aequorin. Ribbon representation of the secondary structure elements of aequorin, showing the bound coelenterazine peroxide as a stick model. Aequorin “in action”. The rays are shown in approximately the true color of the light emitted by aequorin. 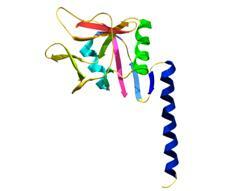 Studies of aequorin are on-going to further characterize the mechanism of action of the photoprotein. 2. 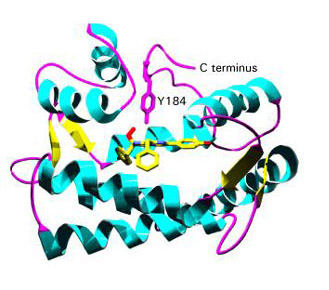 The crystal structure of MarR, a regulator of multiple antibiotic resistance. MarR is a regulator of multiple antibiotic resistance in Escherichia coli. It is the prototypic member of a family of regulatory proteins found in the Bacteria and the Archae that play important roles in the development of antibiotic resistance, a global health problem. 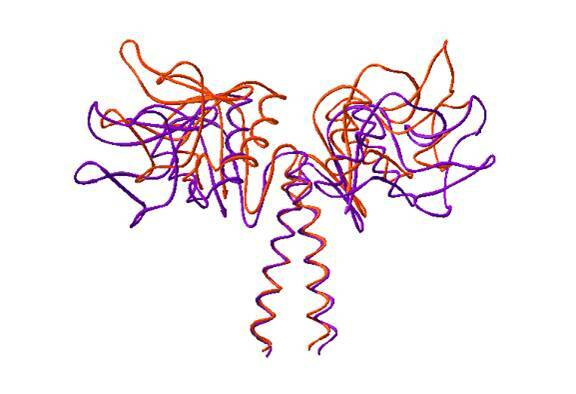 This is the first reported crystal structure of a member of the MarR protein family. The structure shows MarR as a dimer with each subunit containing a winged-helix DNA binding motif. In this structure, the protein is bound to an inhibitor, salicylate. 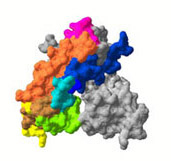 Ribbon diagram of MarR dimer with one subunit colored. Bound salicylate is shown in space-filling representation. MarR was originally identified as a component of the E. coli marRAB locus and negatively regulates expression of this operon. Proteins of the MarR family control an assortment of biological functions including resistance to multiple antibiotics, organic solvents, household disinfectants, and oxidative stress agents, collectively termed the multiple antibiotic resistance (Mar) phenotype. These proteins also regulate the synthesis of pathogenic factors in microbes that infect humans and plants. Inactivation of MexR, a family member in P. aeruginosa, leads to the overexpression of a multidrug efflux system, which is a major determinant for the very broad resistance phenotype observed in this host. Sequences of several members of the MarR family. Secondary structure elements of MarR are shown color-coded to correspond to the ribbon diagram above. In the sequences, identity is indicated by red, high conservation by yellow, lower conservation by blue. The Mar phenotype in E. coli is attributed largely to the action of MarA, the expression of which is regulated by MarR. MarA is a transcription factor that autoactivates expression of the marRAB operon and regulates the expression of a global network of more than 60 chromosomal genes. Constitutive overexpression of MarA or a MarA homolog in many of these strains is a key contributor to the maintenance of the resistance phenotype, particularly with respect to the fluoroquinolones, and recent studies have documented the selection of Mar mutants, bearing mutations in MarR, MexR, or other homologous loci, in E. coli, Pseudomonas aeruginosa, and other organisms during antimicrobial chemotherapy. These data strongly support a role for MarR as a critical “stepping stone” toward the failure of antimicrobial chemotherapy. We are pursuing further studies on MarR and it’s interactions. Four major proteins are found in the fluid at the lung surface, these have been designated surfactant proteins A-D. Two of these, surfactant proteins A and D (SP-A and SP-D), have important roles in innate immunity, providing key, strategically-placed, components in our defense against inhaled pathogens. SP-A and SP-D are homologous proteins belonging to the collectin family of lectins. 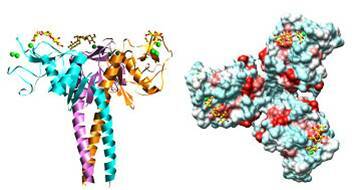 Despite many common sequence and structural features, the two proteins have distinct molecular targets. We are working to provide a more detailed structural characterization of the proteins and their interactions to better understand the mechanisms employed by these proteins in targeting surface molecular features on pathogens. SP-A and SP-D form homotrimers in which the ligand-binding function is provided by a headpiece, carbohydrate recognition (CRD), domain on each subunit. These CRDs form trimers through neck domains and collagen-like tail domains. The tail domain contributes to higher level oligomerization seen in both proteins and the head and neck together (NCRD) form the minimal trimer unit able to bind to target ligands. It is these NCRDs that have been the main focus of our studies. We have determined the first crystal structure of the SP-A NCRD and evaluated its relationship to the SP-D NCRD structure. Surface charge and hydrophobicity representations indicate significant differences in the target-binding “face” of the trimer. There are also different head-neck angles in the two proteins which alter the shape of the target-binding face from a flatten surface in SP-A to more of a bowl in SP-D. Comparison of SpA (orange) and SpD (purple), showing difference in angle of “head” domain with respect to “neck”. We have also determined several structures of SP-D complexed with carbohydrate and other ligands showing that with ligands larger than a disaccharide, there are surface interactions beyond the prime lectin site. For instance, maltotriose and nitrophenyl maltoside bind at one end to the lectin site but extend to interact at the other end, through ring stacking interactions, with a surface-exposed Phe (335) and through hydrogen bonds to other neighboring residues. We are continuing to evaluate such alternative surface sites as the means by which both SP-A and SP-D achieve selectivity in their target binding. We continue to study the interactions of Sp-A and Sp-D and how these interactions influence the binding and neutralization of pulmonary pathogens. The crystal structure of the photoprotein aequorin at 2.3A resolution. (2000) Head, J.F. Inouye, S., Teranishi, K. and Shimomura, O. Nature, 405, 372-376. A crystal structure of the nucleoplasmin-core decamer suggests a model for histone octamer and nucleosome assembly. (2001.) S. Dutta, I.V. Akey, C. Dingwall, K.L. Hartman, T. Laue, R.T. Nolte, J.F. Head, C.W. Akey. Molecular Cell 8: 841-853. The crystal structure of MarR a regulator of multiple antibiotic resistance at 2.3 Å resolution. (2001) M. N. Alekshun, S. B. Levy, T. R. Mealy, B. A. Seaton and J. F. Head. Nature Structural Biology 8, 710-714. J.F. 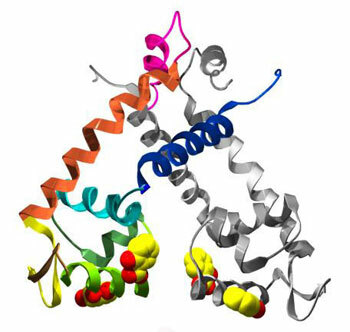 Head , N. Swamy, R. Ray Crystal Structure of the Complex between Actin and Human Vitamin D-Binding Protein at 2.5 A Resolution. Biochemistry. (2002) Jul 23;41(29):9015-20. Head JF, Mealy TR, McCormack FX, Seaton BA (2003) Crystal structure of trimeric carbohydrate recognition and neck domains of surfactant protein A. J. Biol. Chem. 278:43254-43260. Namboodiri VM, Akey IV, Schmidt-Zachmann MS, Head JF, Akey CW. (2004) The Structure and Function of Xenopus NO38-Core, a Histone Chaperone in the Nucleolus. Structure 12:2149-60. Meng, J., Vardar, D., Wang, Y., Guo, H-W., Head, J.F. and McKnight, CJ. (2005) The High Resolution Crystal Structures of Villin Headpiece and Mutants with Reduced F-Actin Binding Activity. Biochemistry 44:11963-73. Crouch, E.C., Smith, K., McDonald, B., Briner, D., Linders, B., McDonald, J., Holmskov, U., Head, J.F., and Hartshorn, K. (2006) Species Differences in the Carbohydrate Binding Preferences of Surfactant Protein D. American Journal of Respiratory Cell and Molecular Biology 35:84-94. Crouch, E.C., McDonald, B., Smith, K., Cafarella, T., Seaton, B.A., Head, J.F. (2006) Contributions of Phe335 to Carbohydrate Recognition by Human Surfactant Protein D: Stacking Interactions with Lung Collectin Ligands. J. Biol. Chem. 30:18008-14. Shao C, Zhang F, Kemp MM, Linhardt RJ, Waisman DM, Head JF, Seaton BA. (2006). Crystallographic analysis of calcium-dependent heparin binding to annexin A2. J Biol Chem. 281, 31689-31695. Shao C, Shi X, Wehbi H, Zambonelli C, Head JF, Seaton BA, Roberts MF. (2007) Dimer structure of an interfacially impaired phosphatidylinositol-specific phospholipase C. J Biol Chem.;282(12):9228-35. Crouch E, McDonald B, Smith K, Roberts M, Mealy T, Seaton B, Head J. (2007) Critical Role of Arg/Lys343 in the Species-Dependent Recognition of Phosphatidylinositol by Pulmonary Surfactant Protein D. Biochemistry. 46(17):5160-9. Wang H, Head J, Kosma P, Brade H, Müller-Loennies S, Sheikh S, McDonald B, Smith K, Cafarella T, Seaton B, Crouch E. (2008) Recognition of heptoses and the inner core of bacterial lipopolysaccharides by surfactant protein d. Biochemistry.;47(2):710-20. 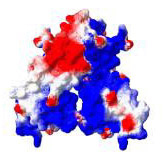 Wang L, Brauner JW, Mao G, Crouch E, Seaton B, Head J, Smith K, Flach CR, Mendelsohn R. (2008) Interaction of recombinant surfactant protein D with lipopolysaccharide: conformation and orientation of bound protein by IRRAS and simulations. Biochemistry. 47(31):8103-13. Shi X, Shao C, Zhang X, Zambonelli C, Redfield AG, Head JF, Seaton BA, Roberts MF (2009). Modulation of Bacillus thuringiensis phosphatidylinositol-specific phospholipase C activity by mutations in the putative dimerization interface. J Biol Chem.284(23):15607-18. Raychaudhury S, Farelli JD, Montminy TP, Matthews M, Ménétret JF, Duménil G, Roy CR, Head JF, Isberg RR, Akey CW. (2009). Structure and function of interacting IcmR-IcmQ domains from a type IVb secretion system in Legionella pneumophila. Structure. 17(4):590-601. Crouch E, Hartshorn K, Horlacher T, McDonald B, Smith K, Cafarella T, Seaton B, Seeberger PH, Head J. (2009) Recognition of mannosylated ligands and influenza A virus by human surfactant protein D: contributions of an extended site and residue 343. Biochemistry.48(15):3335-45. Dr. Erika Crouch, Dept Path. & Immunol., Washington University School of Medicine, St. Louis. Dr. Kevan Hartshorn, Dept Medicine, BU. Medical Center, Boston. Dr. Satoshi Inouye, Chisso Corp., Yokohama, Japan. Dr. Stuart Levy, Tufts University School of Medicine. Boston. Dr. Frank McCormack, Dept. Pulmonary and Critical Care Medicine, Univ. Cincinatti, OH. Dr. Barbara Seaton, Dept. Physiology and Biophysics, BUSM.